Back from left: Team Fiji Boxing’s assistant coach Napoleon Taumoepeau, Ajay Amrit, head coach Pauliasi Ratu and assistant coach Osea Nanovu with boxers from Team Fiji Boxing stable. 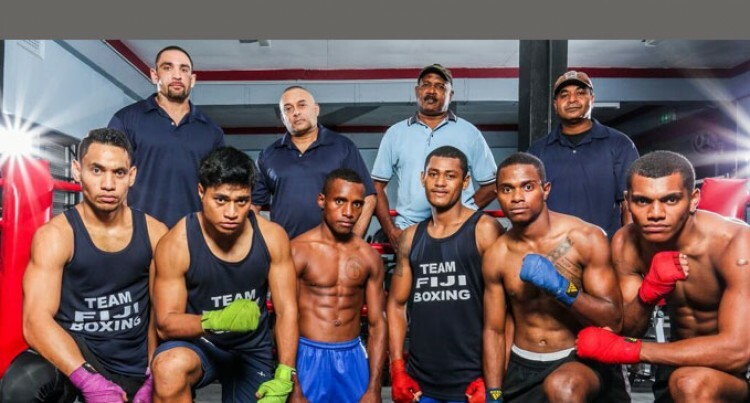 Team Fiji Boxing is finally back in international competition after being banned from taking part in international events for the last couple of years. As necessary by AIBA (Amateur International Boxing Association) the World Governing Body of Amateur Boxing, Fiji required a brand new board and a constitution to be put in place; this happened only seven weeks ago. Regardless of the short time frame to get up and running Team Fiji Boxing has already been able to host two amateur boxing shows at the National Fitness Centre in Suva and a box-off to recruit potential stars in the sport of amateur boxing. They have also been able to get an elite squad together that will train for the upcoming Pacific Games in Port Moresby and have already met all the stringent rules and requirements plus finances needed to send a team across to compete at these regional games. This is quite a feat in the very short amount of time that the association has been up and running and they have also found time to organise an international competition which took place on Saturday evening against Team Nauru Boxing. The elite boxing stable formed has 10 boxers at present but the association are always looking for more talented amateur boxers to join the squad and if you are good enough and your club is willing to release you then you will certainly be welcomed with open arms to join the team and possibly represent Fiji in upcoming tournaments at home and both regionally and internationally as the association grows. Team Fiji Boxing is looking to eventually have a stable of about 15 to 20 boxers as they look towards competing first regionally and then moving on to international competition in the future. With an elite boxing stable in place and more athletes to join, the boxers have a rigorous daily training schedule which is collaborated by three assistant coaches and one head coach. Firstly in the mornings, roadwork is carried out by assistant coach Ropate Sivo, who monitors the boxers as they run between 10 to 15 kilometres, this is draining on the fighters but builds up stamina which is needed over the course of a fight. At lunchtime assistant coach Napoleon Taumoepeau takes the fighters through a tough and rigorous strength and conditioning training routine which is especially formatted for speed and recovery of the boxers. This is especially needed as nowadays all elite athlete fitness and recovery levels are optimum in the international arena. In the evenings assistant coach Osea Nanovu works on technical training with the boxers, this is intended to sharpen their skills set for upcoming competitions and also hard, skillful and sometimes brutal sparring sessions are conducted under the watch of head coach Pauliasi Ratu. All in all the team has gelled very well together and we can be proud that our boxers are getting the best training and mentoring available in Fiji bar none. Another important component for Team Fiji Boxing is its sponsors and once again the board have managed to work with a host of premier companies who have a heart of gold like Ravindra Nath, owner of Wishbone and Pizza King Restaurants, Praveen Singh of Lincoln Refrigeration, Bred Bank, Digicel and BSP; it is through committed organisations like these that help amateur boxing in Fiji. We should feel proud that the whole of Team Fiji Boxing, whether they be the fighters, coaches or the board members are working together not only for the betterment of the boxers but also the betterment of the sport that they love. – The writer is a Fiji Sun columnist.